The mourning of Muharram is an important period of mourning in the Shia’s branch of Islam, tking place in the first month of the Islamic calendar. Many of the events associated with the mourning take place in the congregation halls known as Hussainia. A Hussainia is a different from a mosque in that it is made mainly for gatherings for Muharram in the mourning of Hussain Ibn Ali (RA). 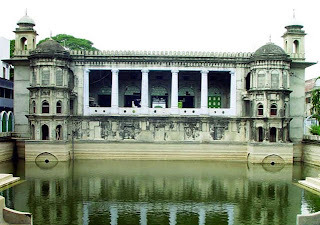 In the south Asia, a Hussainia is also referred as an “imambara”, imambargah or “Ashurkhana”. In Bahrain it is acalled a “ma’tam”. 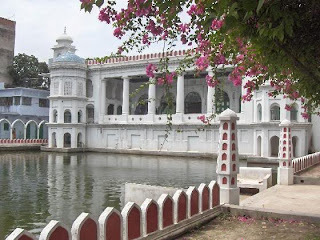 Hossaini Dalan at old Dhaka is such one of the oldest imambara in the Indo-Pak subcontinent. 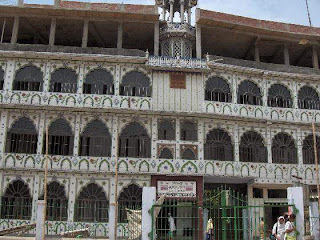 Legend has it that one Sayyid Murad built the building during the Subedari (Governorship) if Shah Shuja, son of Mughal emperor Sah Jahan after receiving instruction from Imam Hussain in a vision. Since then, the building has been enhanced and renovated between the year 1996 and 2006 under the auspices of able management team and donors from both home and abroad. At the battle of Karbala imam Hussain Ibn Ali, a grandson of prophet Muhammad (SM) the founder of Islam and Shia Imam was killed by the force of the second Umayad caliph yazid I. The event is marked by arranging ‘majalis’ to review Islamic teachings and to commemorate Hussains’s sacrifice. The mourning reached its climax on the tenth day, known as Ashura, on which the forces of Yazid killed the 72 individuals who fought, including Hussain and his family and supporters. Imam Hossain embraced the martyrdom in Karbala, Iraq on 10 october 680 AD. According to Shi’a school of thought, the events of Karbala reflect collision between good nad bad, virtuous versus wicked. Imam Hussain was a revolutionary person, righteous man, the religious authority and Imam of Muslim Ummah. As the representative of his granfather Prophet (SM), Imam Hussain’s main concern was to safeguard and protect the follower of Islam and guide them to the best of his ability. Shi’as believe , Muawiya was out to establish a permanent Ummayyads rulership over the muslim ummah by doing it in the name of Islam. But Imam Hussain brilliantly succeeded in foiling this pan at the expense of his valuable life.